I've been thinking a lot about how I should introduce this recipe. Or if I should really call it a recipe as it is a recommendation, a spur-of-the-moment suggestion made by my mother-in-law more than a year ago while we were talking about fish, soups and the newly planted lavender in our front yard. Chermoula is a bold, garlicky, spicy sauce and marinade used all over Algeria, Morocco and Tunisia to spice up not only fish and seafood, but also poultry, meat and vegetables. Though recipes differ from one cook to another, its base is usually a harmonious mixture of garlic, spices (usually cumin and sweet paprika), fresh herbs (cilantro or parsley) and acid (lemon juice or white vinegar). Some might add onions, others saffron, preserved lemons, cayenne peppers, or even nuts, in which case we are leaning more towards pesto. But just like pesto, the process is as easy as peel, measure, pound and enjoy. The result is a zesty pool where every fish would like to swim in and every one of your senses would enjoy. And while the world does not need another chermoula recipe, these two versions, as my mother-in-law explains, are interesting in respecting the quality and variety of fish you are cooking. The spice infused chermoula complements the robust flesh of oily fish while the less conventional thyme and ginger chermoula balances the delicate flavor and texture of white fish without being overpowering. 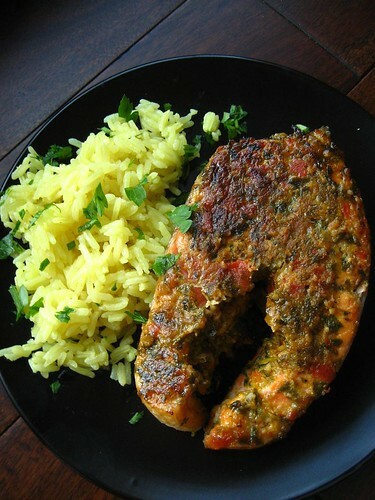 I came home last Saturday from the Italian market with gorgeous salmon steaks, plump garlic and fresh cilantro; chermoula was the first intuition that came to mind for an enticing yet light and effortless dinner. The garlic peeled, the cilantro washed and its leaves plucked I set to put everything along with spices, lemon and olive oil in my tiny food processor. 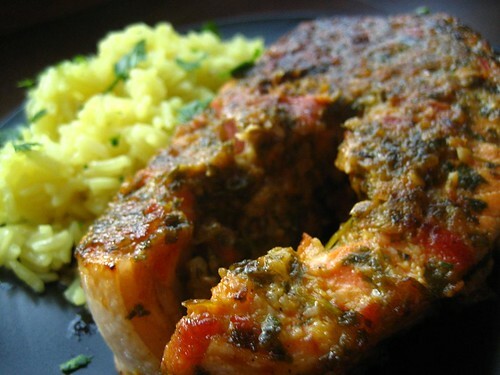 A few noisy twirls later, my chermoula was finally ready to embrace the salmon. After the pan was heated and the olive oil shimmering, I added my salmons. Cook, do not disturb, four minutes, flip, do not disturb, four minutes, serve. A squeeze of lemon, maybe some rice or greens on the side and there you have it. Quick, easy, exquisite. No recipe reading required. Just head to the kitchen and start cooking.In the near future, I'll share with you my chermoula recipes for poultry and vegetables. Chermoula for oily fish: salmon, trout, sardines, swordfish, whitebait, fresh tuna, anchovies, eel, mackerel, smelt and bluefish. Grilling, baking, steaming and pan-frying are all ideal cooking choices for oily fish. Mix all the ingredients in a food processor. Season the salmon steaks, or any oily fish you are using, with salt and black pepper on both sides. Coat evenly with all the chermoula and marinade for at least one hour. In a pan, heat 1 1/2 tbsp of canola oil until shimmering but not smoking. Cook over medium heat until browned and cooked to your liking, 3 to 4 minutes per side. To have a perfect crust, avoid disturbing the fish while it's cooking. Transfer the salmon to a plate and squeeze some lemon on top. 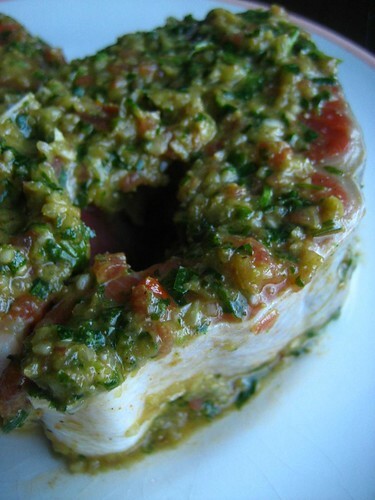 Chermoula for white fish: fish like cod, haddock, sea bass, whiting, sole, halibut, flounder and turbot. Mix all the ingredients in a small bowl. Season the white fish lightly with salt and pepper on both sides and coat generously with the chermoula. Marinade for an hour and cook as desired. It is best to cook white fish using a method such as steaming, poaching, baking in parchment parcels or poaching, so that most of the moisture is retained. 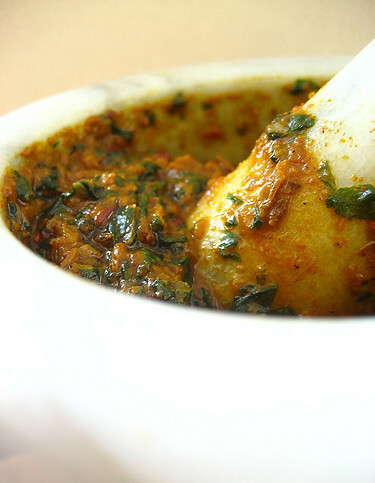 When grilling or baking white fish, it is best to marinate it or cook it in a sauce. You can add some fresh tomato sauce or chicken broth to the chermoula to make a sauce and let it thickens at the end. This looks beautiful! Bookmarked and looking forward to trying the recipe. Both of these look wonderful! Can't wait for my herb garden to come back to life after this winter. what tiny food processor do you use? - Madeline, you've got a lovely family blog. A friend of mine made me a similar tea when I was expecting my second daughter. And I see your baby sister is a fellow Michigander as well ;) Happy cooking! Hope you'll like it. -Lydia, I guess after the harsh winter we had this year, we all can't wait for spring and for our small patch of garden to come back to life. - Radiya, BTW, Love your name! I have a cousin with the same name ;)The tiny food processor that I reach for quick and very efficient results is this hand blender with its little chopper It is bit expensive but really get the job done and will last for years. You can go for the cuisinart if you won't use it that often and will mainly chop herbs and soft ingredients, which is at half the price, but after having one die on me and the blade coming off if I decide to ground some almonds, I've decided to move on to another one. As for the rice, it's quite simple: for 4 persons: in a saucepan put 1 cup rice (I used jasmine rice but you can use basmati or any long rice) 1 tbsp butter, 1/2 tsp ground turmeric. Stir until the butter melts, the rice gets covered in the fat and becomes yellow. Cover with 1 3/4 cups of chicken or vegetable broth. Bring to a boil. Reduce the heat to medium-low. Cover and simmer for 15 minutes. Remove from the heat, do not remove the lid and let sit covered for 5 minutes. Remove the lid, add chopped parsley, fluff with a fork and serve. There you have it, Radiya. Enjoy! Warda, You have a beautiful and graceful way with words, ingredients and photographs. I thoroughly enjoy your blog. With each new post, you make my day! Oh I love chermoula! This thyme and ginger version sounds wonderful. I'm looking forward to trying it out! I've definitely been meaning to try out chermoula and your recipe sounds like a good start! The finished dish looks absolutely gorgeous! Wonderful chermoula recipe. The one my dad taught me is more tomato "heavy" but as you said, there are many recipes out there. Thanks for stopping by my blog and leaving a comment. Baraka Allahu fik. I hope you get a chance to try out my Baghrir recipe. It's really good and easy to make. I made this for dinner last night. Incredibly easy and incredibly flavorful. I upped the herbs a little bit, it seemed a little heavy on the onion. Will make again. Mmmhhh, so delicious looking! I love North African food. I am not willing my herb garden to grow faster! This looks like a brilliant dish. I've never seen the white fish chermoula. Quite excited to realize I have all the ingredients on hand; I know what we'll be having for dinner. - Mary, you are so sweet! Thank you very much and may your day always be blessed! - Hanaa, Your beghrir recipe really intrigued me with the use of milk in the batter so we will definitely try it this weekend inchaalah! - Bridgett, I can't wait for my herb garden to come back to life as well, especially for the mint so we can treat ourselves to mint tea. Yum! - Indie.tea, you have a gorgeous blog! Hope you will get the chance to try it. I use chermouls alot! not only for fish thou - chicken salads etc. - Heni, You have some appetizing recipes in your blog. The roasted peppers salad from Mostaganem (The city where I was born) made me drool. Ya3tik el saha! Iam sooo making it!!! looks wonderful. I always enjoy your posts and recipes. This looks so easy make. Thanks for sharing! Your pictures are wonderful!